Knowledge and awareness is power. What is the pelvic floor? Why does it matter and how can yoga enhance your pelvic health? Do you have questions about bladder and bowel function and are not sure who to ask? Have you ever been instructed to engage your pelvic floor in yoga or exercise class and not known what that meant? If you have any questions regarding the pelvic floor, this workshop is for you. This workshop is led by Jennifer Gelfand, Doctor of Physical Therapy and Certified Yoga Teacher, and Kirsten Twaite, Doctor of Physical Therapy. Both Jenn and Kirsten are physical therapists at Jade who specialize in pelvic floor health and rehab. In this workshop, Jenn and Kirsten will share their expertise on the anatomy and intricate function of the pelvic floor. They will lead you through a sequence of breath work and yoga postures that will increase your awareness of pelvic floor engagement, coordination and flexibility. This will empower you to achieve optimal health of your pelvic floor with your current yoga practice and learn how these skills can translate into your daily life. 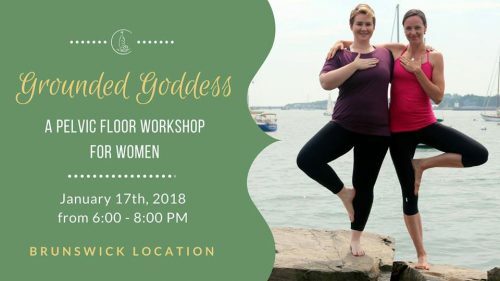 – This workshop is for women only. – All props and mats are provided. – This class is appropriate for all levels, including beginners. – We do ask that all pregnant participants have been cleared for exercise involvement by your healthcare provider before attending. – If you are currently experiencing pelvic pain or if you are unsure if this class is for you, please call with any questions! *Spaces are limited and fill up fast, pre-register today at https://www.jadeintegratedhealth.com/upcoming-workshops or by calling (207) 844-8280.